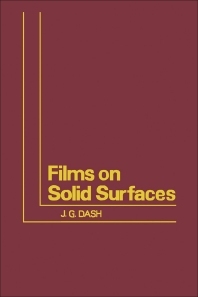 Films on Solid Surfaces presents the physics and chemistry of physical adsorption. This book contains 10 chapters that are ordered according to the flow of a course given in a graduate study in University of Washington during 1973. The introductory chapter presents the motivation for the completion of the book. As the motivating factors are established, the book follows with the topic on atomic nature of physical adsorption and the states of single adsorbed atoms. A review of experimental techniques for the study of solid surfaces and films is given, as well as a discussion of substrate preparation and equilibrium thermodynamics. The various states of films and their phase transitions encompass four chapters. Lastly, the book also reviews thin film superfluidity. This book specifically caters to scientists in the fields of physics and biology working on physical adsorption and surface science.